Analysts said Sony's Reader Daily Edition is a direct challenge to Amazon's best-selling Kindle device. It also has an application that can be used to "borrow" books from local libraries for 21 days. "By going open, Sony helps compensate for its biggest weakness: its lacklustre eBookstore, which pales in comparison with Amazon.com," said Sarah Rotman Epps, an analyst with Forrester Research in her blog. Sony's two current e-reader devices do not offer wireless connectivity. Amazon has so far dominated the e-reader market with its wireless Kindle devices. In May of this year, the firm unveiled a new version of the gadget aimed at reading newspapers, magazines and documents. The Kindle DX packed a screen that was double the size of previous models. It offer 46 newspapers, including The New York Times, The Wall Street Journal and USA Today. However, it was criticised for its high price of $489 (£340). Ms Rotman Epps said that Sony's new device "makes the Kindle look like an oversized calculator." 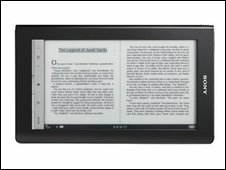 Unlike, the Kindle, the Sony device features a 7-inch (17.8cm)touchscreen interface which can be used to read books in portrait or landscape form. The Japanese firm has also signed a deal with US network operator AT&T to allow users to download books wirelessly. 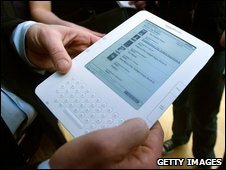 Sony also unveiled an application which allows users to download e-books from their local libraries. "At the end of the library's lending period, e-books simply expire, so there are never any late fees," Sony said. Earlier this month the electronics giant also announced that it would stop using a proprietary standard for e-books in favour of the ePub open format. "Enabling consumers to access free eBooks via the public library network and Google's public domain collection (which now tops 1 million volumes) - and letting consumers buy ePub books from other sources and read them on Sony's devices -greatly expands the value proposition of its devices," said Ms Rotman Epps. Sony said it would announce deals with newspapers later in the year. Are we ready to say bye to books?